There's always more to see and do. I love to write. My books are mystery novels set in the Canadian wilderness, and I self publish with First Choice Books in Victoria, B.C. They do all the design work and printing, but for the covers they need photos, which I provide from my trips. One would think that with thousands of photos to choose from (I’m an enthusiastic amateur), that shouldn’t be a problem, but unfortunately, I usually shoot horizontal format, and book covers require a vertical orientation, at least for the front. Sometimes Felicity, my designer, can crop a horizontal photo, as was done for the book above. But it’s better to provide her with verticals to choose from. I just submitted the text for my next book, Nahanni, along with several photos. The story involves a rafting trip on the Nahanni River in the Northwest Territories, so somewhere on the front or back, I want to show Virginia Falls (the iconic feature of the Nahanni), the river, and a raft. What I like, what I want, and what can be actually be used can differ. The photos below illustrate some of the problems. My favourite photo of the falls, but it fails a crucial test: there’s no place for the book’s title. Virginia Falls from the air. So I found some photos taken from below the falls. This one has all three elements plus space for a title, but the raft isn’t very exciting. This is a better photo, but there’s no raft and very little river. Here the raft is great, there’s lots of river, but the falls are minimized. The next one is probably not suitable for the front, but my tale is dark, and it might find space on the back. Here’s another of my favourites. The scenery’s beautiful and majestic, and there’s room for the title, but is it dramatic enough? No falls, but river, raft and dramatic canyon. Another possibility for the back. Not dramatic enough for the front. As always, I’m eager to see what Felicity proposes; she usually works with two or three. And I think I’ll spend a month this summer taking vertical photos for the book I’m currently writing in order to have more to choose from. My books are available on Kindle. The cost of postage makes shipment of hard copies impractical, but they are usually available at Café Books in Canmore, Alberta and Friends of Yoho in Field, B.C. I could have published this story as another of my adventures: the place was Curator Lake Campground in Jasper National Park, the time was six years ago, and the events occurred almost exactly as described. In fact, I initially wrote it in first person and put it aside because I didn’t have a blog then. When I decided to try my hand at fiction, the grizzly encounter seemed as good a place to start as any. I changed the landscape a bit and added a female character named Mora Lassan. She seemed interesting, but I didn’t know her well; at the time, she was simply a backpacker, much like myself although certainly not me. 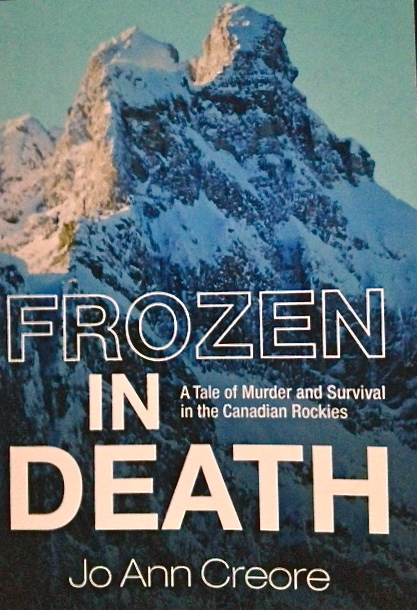 What follows is Chapter One of my mystery, Frozen in Death. The grizzly appeared without warning. Mora caught the movement in her peripheral vision as she was rummaging through the food bag that lay open on the ground beside the picnic table. Sensing danger, she angled her head for a better look, her eyes also taking in the food that was spread out for a late lunch. The bear must have come up from the creek that trickled over rocks beside the backcountry campground, and it was digging beneath an aspen sapling that was barely sixty feet away. As yet, it hadn’t seen her. Having six hundred pounds of uninvited furry guest interrupt one’s meal would send most backpackers into at least a mild panic, but Mora Lassan wasn’t the average backpacker and this was far from being her first bear. Still, she insisted on certain proprieties in such encounters. You’re a little too close for comfort, big boy. Addressing silent comments to her visitor, she reached automatically for the bear spray on her belt, only to discover that she had left belt and spray in her tent at the far end of the narrow campground, and of course, on the other side of the bear. That certainly got the adrenaline flowing. “You woolly-pated loon!” she muttered, annoyed with herself. Uncomfortably aware that she was alone in the campground, being the first to arrive that day, she drew a deep breath as she weighed her limited options. Even if other hikers appeared in the next few minutes, they were just as likely to make a quick exit as help. Grizzlies had that effect on people. Still bending motionless over the food bag, she scrutinized the powerful muscles that rippled under the lustrous coat as the bear lazily pawed clumps of dirt from the ground, partially uprooting the young tree. Above the sleek cinnamon fur of the body, the hair on the massive, pale-blond hump showed the grizzled tips so typical of the species. This was an adult, almost certainly a male from its size, in prime condition. Her experience with grizzlies told Mora that she could probably back away safely, but then the opportunistic bear would be drawn to her food, so much richer in calories than its normal, vegetarian diet. And that would be the first step on a march to death. Once a bear found human food at a campground, it tended to return and become first a nuisance and then a menace, eventually forcing the park staff to destroy it. I can’t let that happen to you, big boy. Not when you’ve caught me sitting here like an idiot tourist, with no way to protect myself or my food. I have to try. Taking another deep breath, she rose to her feet so that the bear could see what she was. Startled by the motion, the grizzly swung its enormous head towards her. Its sleepy expression and close-set, blinking eyes gave scant evidence of the intelligence and perfectly adequate vision that she knew it possessed. Mora held her ground but was careful not to stare directly at the intruder. Making an agile about-face, the bear galloped back to the creek, where it reared up on hind legs to a towering height. Even from a distance, Mora could see the lethal claws that extended a full four inches straight out from the toes of its huge forepaws. Rotating its head side to side, the grizzly sniffed the air, trusting nose more than eyes or ears to identify the thing that had disturbed it. That’s right, big boy. Keep that nose working. You’re totally wild, and you have no idea what I am or what kind of threat I pose. Let’s keep it that way. Mora was relieved by the animal’s shyness, guessing that it wanted nothing to do with her, but she had to get the bear spray just in case. It wouldn’t take much to trigger an attack—any hint of fear or aggression would do the trick—so as she walked past the aspen and into the tenting section of the campground, she avoided looking toward the creek. I am woman, the supreme predator, she told herself, hoping to project an aura of confidence that the bear would sense. Yeah, sure. Oh, really well done, Mora! Belt and bear spray were in the tent vestibule, where she had stupidly dropped them in her haste to make a cup of tea and satisfy her hunger. Canister in hand, she headed back toward the picnic table. The grizzly was still in the creek, on all fours now, but alert. When it saw her returning, it turned, bounded up the hill from which the creek descended, and disappeared into the trees. Heaving a sigh through pursed lips, Mora sank down at the table and reached for her water bottle. I’m really getting too old for this, she reflected, shaking her head. Two minutes later, another backpacker strode across the creek and into the campground. “You just missed the grizzly!” Mora announced with a satisfied grin. She knew that she would have a great story for other travelers that evening and for her friends at home. Without a doubt, the close encounter would be the highlight of her trip. She had no idea how wrong she was. If you enjoyed this first taste of the novel, you can find the book on Amazon Kindle for $2.99 USD. After years of blogging about my own adventures in the mountains and wild places of the earth, I can at last tell the stories of people I wish I had met doing things I wish I could do. I know these people because I created them and allowed them move into my life, which they have enriched for the last three years. They are now ready to leave the protection of my endless revisions and go forth into a world that may love them as I do, find them wanting (the fault being mine, of course), or simply ignore them (the most likely fate for the creations of a self-published author). Available on Amazon Kindle for $2.99. Mora Lassan, a tough-as-nails mountaineer and retired professor, travels to a remote mountain pass north of Banff to scatter the ashes of her late husband. As she hikes from her high camp to the pass in worsening weather, she encounters two inexperienced climbers who claim that all their camping gear has been stolen and their guide has abandoned them. She takes the young couple to her camp and next morning finds the guide’s body at the bottom of a gorge. On returning to her camp, she discovers that her own gear has been stolen and the two climbers are missing. Mora is drawn into a web of treachery and murder that has roots years in the past and will involve not only the missing climbers but also all of the people who are camped below the pass. As a savage storm cuts off help from the outside, the killer strikes again, and Mora may be his next victim. But in the wilderness, nature always has the last word, and survival becomes the only imperative. 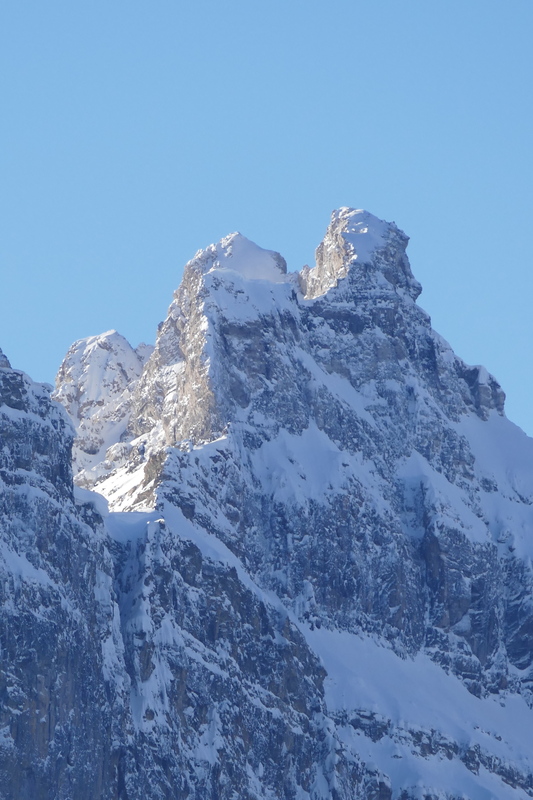 Written by an author with an intimate knowledge of the Canadian Rockies, the book evokes the beauty and harsh reality of the mountain environment. One final note: If you buy the book, could you please take the time to post a review on Amazon? I will be very appreciative. Mora Lassan. Mountaineer, adventure addict and retired professor of medieval and Renaissance literature, who swears like a trooper in Elizabethan English. A tiny bundle of grit and determination, she has attitude, lots of it. She knows how to survive in the wilderness, but sometimes attitude, grit and knowledge aren’t enough. Joe Harris. Good looks, a brilliant mind, a generous heart. But also a tendency to act without thinking and a quick temper, qualities that sometimes get him into more trouble than he can handle. Every story needs a handsome young hero, but Joe has a lot of growing up to do. That is, if he lives long enough. Wally LaPierre. Outfitter in Banff and rancher, passionate about his work. A shrewd, muscular, gentle giant with a medieval sense of chivalry. His steadfast loyalty to friends sometimes conflicts with his strong sense of right and wrong, leading to decisions that have unintended consequences. Erin Soames. A young lawyer with all of the toughness of Mora. She hopes that Joe will eventually mature into the man she knows he can be, the man she can marry, but she’s cutting him no slack. Nature. Yes, Nature is an active participant in my stories, exerting her power on heroes and villains alike. These novels arise from my lifetime of climbing, backpacking, ski mountaineering and exploring the Canadian mountains and arctic tundra. The characters and stories are fictional, but the landscape is as real as I can make it, and my goal is to evoke both the beauty and the harsh reality of the wilderness. The first book is ready to go. Details in the next post. For most of my life, I have gone wherever and whenever wilderness and adventure called. No part of the globe was too remote, no means of access too difficult. Material possessions mean nothing to me; I spend my available time and money on that which gives me joy: experiences and memories. These don’t wear out, don’t need replacing or updating, and since they take up only enough room in my little apartment to hold my outdoor equipment, there’s always room for more. Since my husband passed away ten years ago, I’ve been to Patagonia, the Galapagos, Kilimanjaro, Botswana and Mongolia, to name only a few destinations. I’ve earned enough Aeroplan miles to be treated with extra courtesy in Business Class. And I have finally had to admit that I HATE FLYING! I hate it enough to stop crossing oceans and wandering around airports in the middle of the night waiting for a connecting flight. The forty-five hours it took to travel from a lodge in Namibia to my apartment in Edmonton last July was the last straw (the entire time was spent on planes and in airports). Am I giving up on adventure? Not at all. The Canadian wilderness, especially the Arctic and the Rocky Mountains, offers all that I need. I’ve sort of been neglecting these places for the last few years, but no longer. In June I will do a two-week rafting trip on one of my favourite rivers, the Firth, that flows into the Beaufort Sea. This summer, there will be some serious backpacking in the Rockies. In September, I’m booked for a trip to the Pantanal in Brazil (have to use those Aeroplan miles), but that will be the final long flight. I’m considering cancelling and instead donating the miles to MSF. Am I slowing down? Definitely. Last summer’s bungee jump at Victoria Falls notwithstanding, my 78 years are weighing on my joints. They would appreciate a little moderation. So what do you do when there isn’t enough time for all the places you would like to visit, or do all the things you still want to do? When there are far more kilometres under your boots than lie ahead? And thus an obsession was born. I have become a writer of fiction, riding on the wings of characters who are not bound by my limitations. My first novel, Frozen in Death, is about to come out. It is set in the place I know best: the Canadian Rockies. More about that in a later post.